We ran the dashboard for all three statewide races in Virginia in 2013 and called a narrow but historic Democratic sweep early in the evening, even for the Attorney General Race which ultimately ended in a recount. In 2014, we dramatically expanded our projection dashboard map to include 13 Senate races tracked publically and a number of private client dashboards for Governor's races. While most races were unfortunately decided quickly the dashboard correctly predicted tight races in Virginia and Connecticut. Perhaps our most timely projections came with gubernatorial races in 2015. For example, in Kentucky the Dashboard accurately predicted the final results within 20 minutes of polls closing and only a handful of precincts reporting. Our 2014 election night projections were updated using live county (or township) election returns from the Associated Press or precinct-level results in a few states where available publicly online. The dashboard is no longer active but you can see the sites that we tracked publicly below as of the final update for each state. Clarity’s real-time modeling is enabled with National Voter File Co-op data from SmartVAN, the country’s leading national voter file. The Coop contains the most up to date voter registrations, the greatest depth of voting history, and more down-ballot district information than any other source, and turns data into action any sized operation. SmartVAN is proudly brought to you by TargetSmart, NGP VAN and EveryAction. 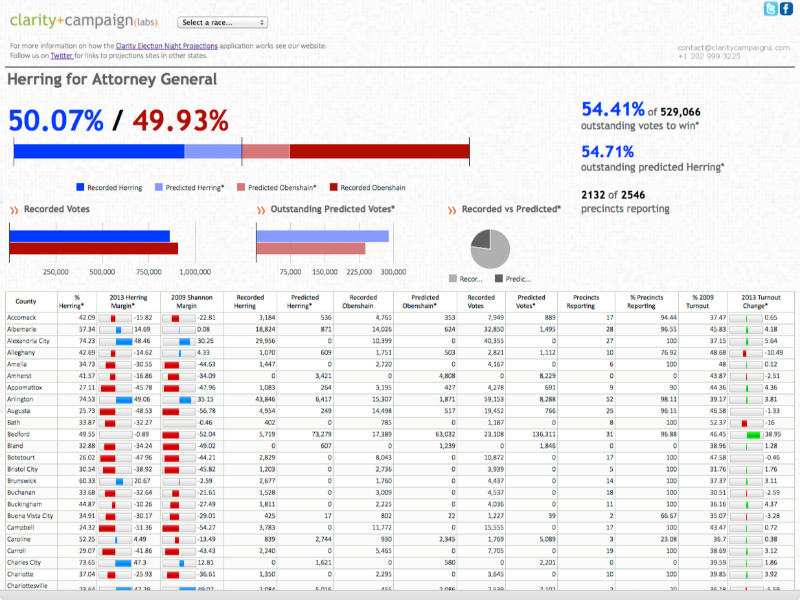 You will notice that not every Senate race has a Dashboard for it. This is for a variety of reasons, including that a race’s result is not in question, the way the votes are tallied, continuing work on how vote-by-mail ballots are reflected in the model, to name a few. Also, in every Governor race this year and many other races you may expect to see, clients have asked for more robust private Dashboards, which take precedence over publishing public versions. Enjoy responsibly and don't blame us for any gambling losses. As a research and development exercise for real-time modeling applications, we built an online dashboard that predicts final statewide results based on partial actual election results. To put it simply, this dashboard will put the actual results into context – a campaign might be in a situation where they are up 10,000 votes with 30% of the precincts or counties yet to report. This application will tell us if that 10,000 vote margin is good or bad, based on the predicted partisanship of those areas that are yet to report. Most recently, we ran the dashboard for all three statewide races in Virginia in 2013 and called a narrow but historic Democratic sweep early in the evening, even for the Attorney General race which ultimately ended in a recount. Follow us on Twitter @claritycampaign for publicly available projection sites in the future. As a research and development exercise for real-time modeling applications, we built an online dashboard that predicts final statewide results based on partial actual results for the Tim Kaine for Senate campaign in 2012. Basically it takes the actual results as they are reported, and uses a constantly self-adjusting model to project the final result statewide based on the results reported thus far (taking into account geographic differences, turnout, performance and our latest Democratic Party Score v3). This is essentially what many media outlets have staff doing behind the scenes in order to ‘call’ races but here you can follow the results in real time and make your own judgement based on the model. As an example, here is a snapshot from the Kaine for Senate boiler room on Election Day 2012 in Virginia (congratulations to an incredible team!). Basically it takes the actual results as they are reported, and uses a constantly self-adjusting model to project the final result statewide based on the results reported thus far (taking into account geographic differences, turnout, performance and our latest Democratic Party Score v4).